It’s game on, Autobots! 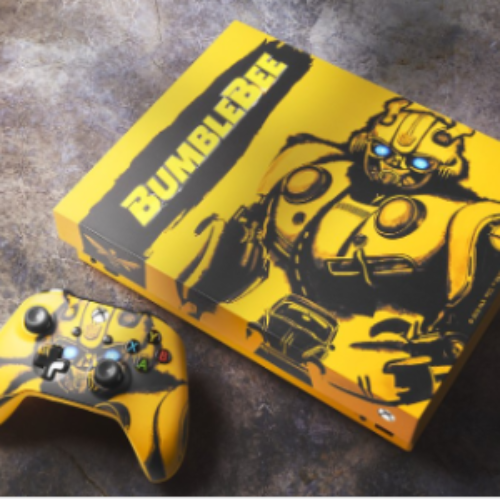 You can enter the Bumblebee Sweepstakes from Microsoft Xbox for your chance to be 1 of 5 winners of a custom Bumblebee Xbox One X with an ARV of $499 and a code to download the movie Bumblebee. You’ll need a Twitter account to enter this one. Just retweet (RT) their post and tag #BumblebeeSweepstakes to enter this awesome contest. Entry ends April 02, 2019. I have to say I’m so impressed with how far video game consoles have advanced in my lifetime. I can still remember the pure joy my kids had when I gave them an Atari, and the endless hours they spent blasting pixelated badies in Space Invader and chasing that single square ball in Pong. Years later they wanted a Nintendo for Christmas, and despite it’s sky-high price for the time of a whopping $100, we acquiesced. I marveled at how sophisticated it was compared to the Atari and my kids lost their minds playing Mario hour after hour. It was so engaging to them, I had to lay down ground rules to regulate their playing time, or I’m convinced they would still be trying to free the Princess right now. It’s a funny coincidence to me that around that same time I was watching them blast those pesky ducks out of the sky with the Laser Blaster, I was also buying them the unique little plastic toys that could be manipulated to change from a vehicle to a robot. You younger folks may not realize that Transformers was a popular cartoon in the 1980’s and the action figures that accompanied the show were all the rage, giving He-Man and G.I. Joes a run for their money. I stopped keeping up with gaming consoles after my kids left the house but when I see commercials for the newest machines like PS4 and Xbox I am blown away with their realism. At one point I had to ask if it was a movie or a game, it was just that photo-realistic. And although I’ve always been cautious about the influence gaming has on our youth, I admit there are a few positive factors. It certainly improves their hand-eye coordination and reflexes, and many games challenge their minds with problem solving and puzzles. Some games imbue an understanding of history and historical events and in nearly every case, they help support a sense of imagination. I’m not sure, adjusted for inflation, if these modern gaming consoles are more or less expensive than the original NES. Either way, they sure seem expensive to me. That’s why I think this is such a great sweepstakes, giving parents, grandparents and young adults alike a chance to win not just one, but one of five of these pricey Xbox One X consoles. How ironic that this offer from Microsoft combines two things that came raging onto the scene in the 80’s, video game consoles and Transformers. It turns out fashion isn’t the only thing that comes back into style. I’m wishing all my fans and subscribers the best of luck to win one of these five custom Bumblebee Xbox’s. Let me know in the comments below what the first gaming console you played or purchased for your kids to play was and if you think they are a good or bad influence on the youth of today.